One of the biggest mistakes this country ever made was to allow APC to come into power in Nigeria. It must be sent packing in 2019. The Peoples Democratic Party (PDP) dodged a bullet; a bomb even with the conduct of its presidential primaries a few days ago. This was conducted in a calm, serene and collected manner. There were no riots. No bombs went off to mark the process as “do or die.” Nobody got killed, maimed or injured. The party did not find it necessary to insult the intelligence of Nigerians by boasting that it now has millions upon millions of fictitious members. Everything was as smooth as silk. The same could not be said of the All Progressives Congress (APC). There is one word that comes to mind describing APC politics today: “shambolic.” APC primaries are characterised by violence, tear gas and acrimony. At the presidential level, the party virtually prevented other aspirants from competing against Buhari. It then showed its contempt for Nigerians by claiming the president, as a sole candidate, obtained a bogus 14.8 million votes. Every right-thinking Nigerian knows the APC does not have a membership even half that size. Neither can it count such a large number of votes within a few hours. The PDP, on the other hand, showed Nigerians it is now one of the few truly democratic parties in the country today. The list of contenders for its presidential ticket was top-heavy with men of timber and calibre. On the ballot were such “juggernauts” as Atiku Abubakar, former vice president of Nigeria; Bukola Saraki, current president of the Senate; Aminu Tambuwaal, current governor of Sokoto; Rabiu Kwankwaso, former governor of Kano; Ibrahim Dankwambo, current governor of Gombe; David Mark, former president of the Senate; Sule Lamido, former governor of Jigawa; Attahiru Bafarawa, former governor of Sokoto; Ahmed Makarfi, former governor of Kaduna; and Jonah Jang, former governor of Plateau. This who-is-who list of aspirants suggested there would be cat-fights and acrimony. Indeed, many APC supporters were anticipating a free-for-all fight to the finish within the ranks of the PDP. But what happened was exactly the opposite. The PDP primary was open, transparent and devoid of rancour. Atiku emerged the clear winner, polling 1532 votes, more than double that of his closest challenger, Aminu Tambuwaal, who polled 693 votes. Indeed, Atiku received more votes than all his other ten challengers combined, who altogether received only 1372 votes. Remarkably, and for the first time in Nigeria’s recorded political history, all the losers in the primary congratulated the winner and pledged to support him. No one complained of rigging. No one spoke of foul play. In spite of the stakes involved, the PDP convention to choose its presidential flagbearer turned out to be one happy family affair. But, true to form, APC was the exact opposite. The party uses a loud megaphone to proclaim its hypocritical anti-corruption credentials. Nevertheless, it could only hold primaries riddled with blatant corruption. In Lagos, the official umpire rejected the declared results, claiming no election took place. Then it was forced, as a result of orders from above, to reverse its verdict. In Imo, the governor’s in-law lost an election, but was declared the winner because the election was annulled and re-taken. At the presidential level, first the nomination fee for the primaries was raised prejudicially from the N27 million of 2014 to N45 million; indicating that the APC has a distinct preference for moneybags steeped in corruption and with money to burn. Then it declared that 2.9 million APC members voted for Buhari in Kano alone; a feat nothing short of outrageous and impossible. It then topped this by announcing that 14.8 million APC members voted for sole candidate Buhari to be the presidential candidate. So doing, APC laid down the marker that it intends to fabricate votes contemptibly during the up-coming 2019 elections. There would certainly be a problem if, after claiming Buhari received 2.9 million votes from Kano alone during the primaries, it is then discovered that Buhari cannot even get 2 million votes from Kano during the election proper. What it means is that millions of votes can be expected to be pulled out of a hat in 2019, to justify this fictitious result declared during the recent primaries. The truth of the matter is that, as a party, APC has turned out to be one big joke. A party that achieved virtually nothing in the last four years is nevertheless intent on telling Nigeria and the world that it has grown stupendously in membership and popularity. This is preposterous. In 2014, the party’s acronym of APC stood for All Progressives Congress. Today, the same acronym is now widely derided as All Promises Cancelled. This is because not only could APC not keep the highfalutin promises it made to Nigerians in 2015, it even denied most of them. In its barely four-year stint in power, Nigeria has moved from the status of being the largest African economy to the derision of being the country with the largest number of poor people in the world. Candidate Buhari promised to make the naira equal to the dollar. However, the exchange-rate of the naira plummeted instead from N198 to the dollar to N360 to the dollar. The reason was simple. Like Nero, the president fiddled while the financial markets burned. He saw no evil and heard no evil as innocent farmers were slaughtered incessantly by Fulani herdsmen. Everything went literally from bad to worse right before our eyes. And yet, the APC would like Nigerians to believe that the same man who has presided over this very sorry state of affairs now has unprecedented popularity in Nigeria. The president’s men must really think Nigerians are dunces. This is the same deceit that the APC meted out in the gubernatorial election in Osun State, where we are meant to believe that people who were not paid salaries for over 2 years still went ahead to vote for the retention of the status quo. The people of Osun must like to suffer. In any case, many of us who refuse to believe these lies are convinced that both the Ekiti and Osun elections will ultimately be overturned by the courts. The truth of the matter is that APC is confronted with an election in 2019 that it cannot win unless it falsifies the vote massively. President Buhari has nothing to show for his tenure. The change he championed has been a change for the worse. In 2014, Buhari dazzled Nigerians by appearing in a western suit and bow-tie for the very first time, in the bid to convince Nigerians and the Western world that this leopard has changed its spots. But that turned out to be one big sham. Today, the sham continues. The same man who said he could not be expected to treat the electorate who only gave him 5 per cent of their vote the same way as those who gave him 97 per cent is now dressed in the native attires of the 5 per cent. It is pathetic to see Buhari now decked out in Igbo clothes, especially after his government neglected the Igbo, violated the rights of IPOB to demonstrate according to democratic protocols, and intimidated them with pernicious military exercises. Buhari’s handlers must really think the Igbo and, indeed, Nigerians in general, are fools. Bereft of concrete policies, the Igbo are expected to vote for Buhari because he decided to wear their native attire and the Yorubas are supposed to vote for him because he made an illegal pronouncement; declaring June 12 as Democracy Day without first repealing the law that made May 29 Democracy Day. Expect his bank account to be frozen while serious investigation is conducted into various allegations that would suddenly spring up against him. Don’t be surprised if we are even told that Atiku is ineligible to run, because it has now been discovered that the former vice-president of Nigeria is not a Nigerian at all, but a Cameroonian. A comparative analysis of the track-record of both men speaks volumes. After his brief spell as military head of state in 1984/85, Buhari did nothing of note for the next 30 years. He did not write a book, give a major policy speech, start a foundation, launch a company or even promote a cause. He only resurfaced briefly as PTF chairman and, at the end of his tenure, PTF was found by the Haroun Adamu commission of inquiry to have been riddled with corruption. Not so Atiku Abubakar. After 8 years as Nigeria’s vice president from 1999 to 2007, Atiku has remained very active in the public place. He is a co-founder of Intels, an oil-service business with extensive operations in Nigeria and abroad. He is also the founder of the American University of Nigeria (AUN) in Yola, Adamawa State. He has been involved in so many philanthropic projects and is indeed, the largest world-wide donor to the National Peace Corps Association in the United States. Moreover, he has written extensively about Nigeria’s public policy and, as can be expected of a former vice-president, is well-versed in national and international affairs. So how can Buhari prevail against a man with such credentials, credentials that are foreign to our dear president? Don’t expect him to accept any invitation to debate Atiku at any time. 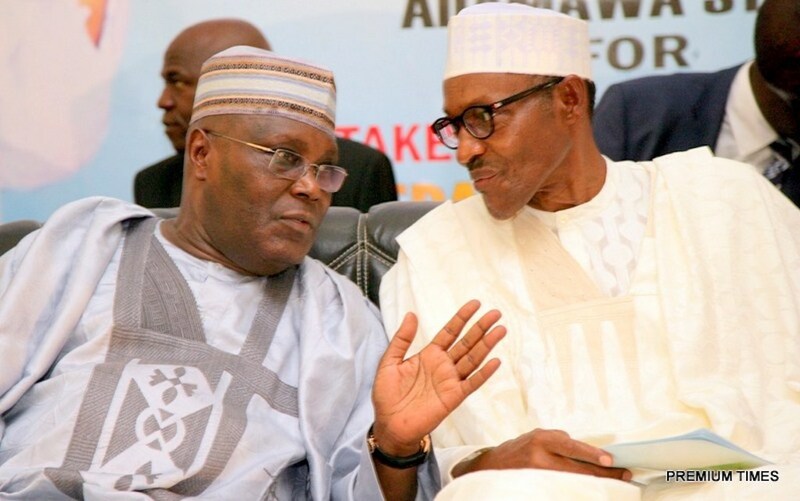 The president simply cannot hold his own against Atiku under these circumstances. He is not a match for him at all. Therefore, expect a lot of shenanigans from the APC between now and election day. Expect the APC party of anti-corruption to probably close down all Atiku’s businesses over the coming weeks and months. That is how the APC candidates run for office, using the instruments of the state to intimidate their opponents. Expect Atiku to be invited by the police on the grounds that he sponsored some armed robbery or the other in some local petrol station. Expect the tax authorities to send him a letter claiming they have suddenly discovered that he has paid no taxes in the last 40 years. It should now be abundantly clear to all and sundry in Nigeria that deception is the nom de guerre of the APC. This party of strange bedfellows has nothing of substance to offer Nigeria. One of the biggest mistakes this country ever made was to allow APC to come into power in Nigeria. It must be sent packing in 2019.